These free, printable calendars for 2019 won't just keep you organized; they'll also add a splash of color and style to your office, kitchen, or just about any room in your home. They truly meld style and function, and you'll be amazed at the calendars you can get for free. There's a variety of printable calendars for 2019 here that include monthly calendars as well as complete planners to help you plan every week and even every day. The styles vary too; you'll find very simple black and white calendars and colorful calendars that are meant to inspire. You really can't go wrong with all the choices here. If you're looking for a different way to keep organized this year, Take a look at these free calendar templates for your favorite word processor. The Handmade Home has made this lovely printable calendar for 2019 that's a complete planner with tons of sections for you to keep track of everything going on in your life. There are multiple different styles that you can print the planner in - multi floral, blue plaid, fall florals, gray stripe, minimal flowers, pastel plaid, pink watercolor, and yellow watercolor. 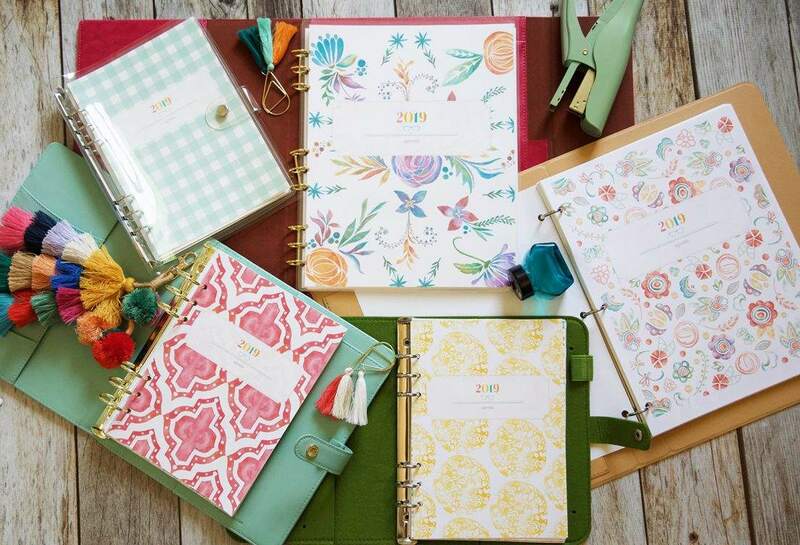 Each page that you print, including the planner cover, will match the style that you like best. These free planners include free, printable cover pages, a year at a glance calendar, contact pages, emergency contact pages, birthday and anniversary calendars, goals pages, divider pages, monthly calendar views, weekly calendar views, to do lists, budget pages, cleaning schedules, menu plans and shopping lists, chore charts, lesson plans, school charts. You can print out just the sections of the planner that you'll use. It makes sure that you'll use the planner instead of getting intimidated by all the pages that may not apply to you. All the pages are available to print on standard size paper or as an A5 size. If you're looking for a unique calendar for this year, you'll want to check out this free 3D 2018 printable calendar from A Piece of Rainbow. It may look like a daunting project but take a look at their folding tutorial, and in less time than you think you'll have the calendar cut out, folded, and assembled. There's a color version, black and white version, and a cut file if you happen to have a Silhouette Cameo or Cricut. You can also download the black and white version and use a free photo editing program to choose your own colors. Botanical Paperworks has four free printable calendars for 2019, each one with a unique style. All of the printable calendars for 2019 at Botanical Paperworks include a cover page and separate pages for each month of the year. Short Stops Designs has created this 2019 printable calendar which will keep you in style all year around. Each month of the free calendar has a fun design included dots, leaves, stripes, and more all in vibrant colors. There's room for you to write on each day, as well as space at the bottom for notes and to do's. The calendar can conveniently be downloaded in portrait or landscape page orientation and prints off one month per page. You'll love this free, printable 2019 calendar from This Little Street. Each monthly page is designed with beautiful hand-drawn illustrations in gorgeous colors that represent each month. There's a beautiful mixture of floral and geometric shapes for each month. With a single click, you'll have the whole calendar downloaded and ready to print. The monthly pages print out as a generous 8x10 size, making it a great choice for a wall calendar that would look lovely anywhere in your home. Colorful Disaster has designed a free printable calendar for 2019 that features simple black and white hand lettering. It's a classic calendar that would be great for any room in your home, including a home office. This free calendar can be downloaded as a PDF file. It prints out to be 5X7, with one month on each page. If you're looking for a free, printable calendar for 2019 that has a bit whimsy and a lot of love going on, you'll want to check out this watercolor animal calendar from The Cottage Market. The animals included on this 5X7 monthly calendar include a fox, squirrel, lamb, rabbit, dog, mouse, hedgehog, bird, raccoon, cat, and deer. This would be adorable hung up in a nursery or even an office. This free, printable monthly calendar for 2019 is filled with modern florals drawn in bold colors. All the illustrations are different, each one brighter than the next. This free calendar prints out with one month per each page laid out vertically. On Sutton Place has a printable calendar for 2019, with each month having a colorful illustration on the top of the month. These are monthly themes that include watermelons for August, pumpkins for October, and more. Besides the monthly calendar pages, the free download also includes a 2019 year-at-a-glance, a weekly planner, a weekly meal planner, a faith planner, and some inspirational free printables. Altogether, it's a 20-page download that will have you set for the rest of the year. You will need to sign up for the On Sutton Place newsletter to get this free calendar but it's free, and you can unsubscribe at any time. 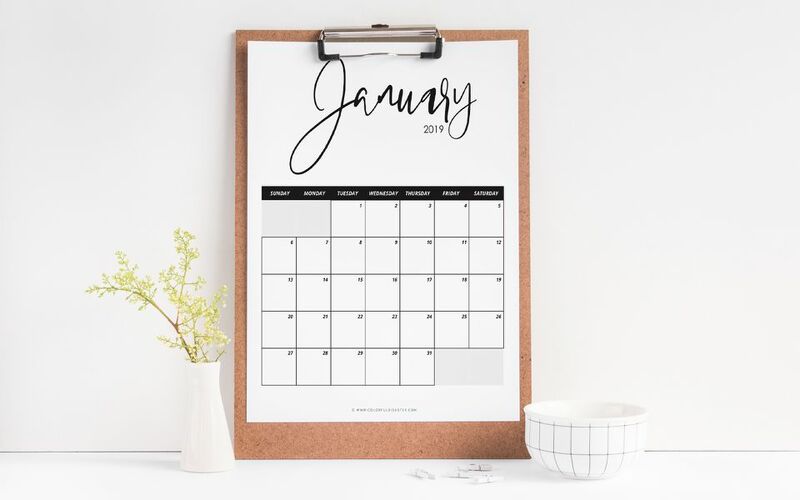 The free, printable calendar for 2019 from Landeelu is sure to keep you organized this year. This calendar has colorful tabs in green, gray, orange, red, yellow, blue, pink, and purple on the upper-right hand corner of each page that calls out the month. The gray grid and days of the week also make it look sharp. At the bottom of each month's calendar, there's a place to write in monthly goals or to-dos. Each month prints on its own page and it's all together in one quick and easy PDF download. There are a portrait and landscape calendars available for download depending on your preference.